A couple of months ago we offered a SharePoint version of Zebra BI to a select group of our customers. After thorough testing, bugs fixed and a lot of features added, Zebra BI for SharePoint is ready for a public release. Lollipop charts are a great data visualization technique. Data visualization professionals and business analysts like them for a good reason. They can be used in similar situations as bar charts and column charts, but they have the advantage of producing a cleaner-looking picture. The sticks of the lollipops are thinner than the bars/columns, which allows the chart to "breathe", while the lollipops force the reader to focus on the most important part of the chart - the values. Jon Peltier, Stephanie Evergreen and Jon Schwabish all wrote their own guides on how to produce lollipop charts in Microsoft Excel - "the primary data visualization tool for most of the world", according to Schwabish. These kinds of guides are necessary because lollipop charts are not included in the default set of charts found in Excel. All of these guides work well for producing lollipop charts in Excel, but they all have one flaw: they take time to complete. FREMONT, CA—January 19, 2016- Zebra BI makes it to CIOReview's top Data Visualization Solution Providers list for its expertise in creating better customized presentations, dashboards and reports, making them perfect from the start. On Thursday, October 22, 2015 Andrej Lapajne (CEO at Zebra BI and IBCS founding member) will lead a presentation on IBCS in front of one of the world's most advanced dataviz communities: Data Visualization New York Meetup group. The meetup will be held at McKinsey & Co. 21st Fl. Conf. Center. In a presentation entitled 'Dr. Hichert's IBCS: Designing reports, dashboards and presentations' Andrej will present the key features of IBCS through real-world examples and discuss their slightly controversial proposition: the design of business information should look (more or less) the same across all companies, regardless of their size, industry or location. It seems the US public is eager to learn about IBCS - the 150 spots available at the meetup filled up in a couple of days and additional 63 members are queuing on the waiting list. 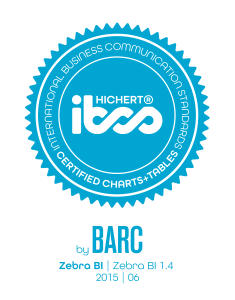 The highly popular International Business Communication Standards, developed by Dr. Rolf Hichert and his associates at the IBCS Association, are rapidly spreading in companies throughout Europe. Some of the biggest companies in Europe (SAP, Bayer, Lufthansa, Philips, Coca-Cola bottlers) have already realized the importance of standardization in business communication. The Standards are finally ready to break into the US market. We at Zebra BI, one of the most passionate supporters of the IBCS, are going to actively contribute to its introduction to the US audience. In today's video we'll show you how you can create the standard profit & loss report (income statement) in a few minutes. Not only that, the finished report is also IBCS compliant. If you have the right tools, it can be done very quickly. This is how a profit & loss report should be done. On June 8th, Zebra BI passed the IBCS certification process, becoming the first "IBCS certified charts + tables" software. The certification commission was impressed with Zebra BI. All templates matched the patterns provided by the certification commission almost identically. Today the Zebra BI version 1.4.1 (that was used to pass the IBCS certification) is ready to be publicly released. This version includes many new features. Read on to get detailed information about each of them. This year's IBCS Annual Conference was held on June 19th, 2015 at Royal Philips Global Headquarters in Amsterdam, The Netherlands. IBCS Annual Conference 2015, the key event for reporting professionals to exchange experience with their peers, thought leaders, consultants and software developers, will be held on June 19th at Royal Philips Global Headquarters in Amsterdam. The conference will offer practical case studies of rolling-out IBCS (International Business Communication Standards) in established corporations, as well as focused discussions led by reporting and visualization experts. Zebra BI is the silver sponsor of this year's conference, where Mr. Ilkay Furmaz of Coca-Cola İçecek, the Coca-Cola bottler for Turkey, Middle East, Central Asia and Pakistan, will deliver the keynote speech on their experience in international roll-out of IBCS-compliant reports and dashboards, implemented with Zebra BI. Andrej Lapajne, CEO at Zebra BI will contribute to the conference by leading a breakout session titled "IBCS charts in practice - real world examples and dilemmas". If you missed our second webinar on Data visualization in depth, we have just uploaded the recording of the webinar on our website so you can watch it in your own time. Make sure you watch it and keep your data visualization skills sharp. Next Tuesday, Apr 14, 2015 at 7pm CEDT we'll be running our second webinar. If you want to learn from Andrej Lapajne (Zebra BI CEO) about data visualization in depth, make sure to go here and save your spot! Most reports, presentations and dashboards fail because of inappropriate or simply bad visualization: wrong choice of charts, nonfunctional colors, confusing data structures, illegible labels, etc. The webinar recording is up! If you missed our first webinar on Best practices in designing financial reports, we have good news for you. We have just uploaded the recording of the webinar on our website so you can watch it in your own time. The feedback we received from the attendees was very positive, so make sure you watch it and keep your reporting skills sharp. Next Tuesday, Mar 17, 2015 at 7pm CET Andrej Lapajne (Zebra BI CEO) will be hosting our very first webinar! If you want to learn best practices in designing financial reports, make sure to go here and save your spot! How do your financial reports look like? All too often, they fall somewhere between messy spreadsheets and “dashboards”, full of poorly labelled and inappropriate charts, 3D effects and speedometers, that simply do not get their message across to the management. Zebra BI will attend the 3rd annual Business Intelligence Agenda conference in Zurich, Switzerland between March 2nd and March 3rd 2015.
Business Intelligence Agenda in an independent annual conference for users and providers from the BI industry, focusing on latest trends in BI. This year's topics include Big Data Analytics, Data Driven Enterprises and Data Scientists. Zebra BI will be present at the conference in cooperation with our Swiss partner Business|Solution|Group. This time, we have a surprise for you: we'll give away one Zebra BI licence to one of the visitors who'll find us there. Don't miss the chance to win a free Zebra BI one-year subscription! Find us at the Business|Solution|Group stand and put your visit card in the tombola box. Maybe you'll be the lucky winner! Can you learn best practice reporting in 15 minutes? Yes, you can! Zebra BI now guides you through visualization and reporting best practices with a nice interactive tutorial. As you see, good reporting is not just about good charts. It's good charts + efficient labelling, correct scaling, using multiple charts, combining graphs into tables and above all, standardizing shapes and colors. Zebra BI version 1.1.0 is out! Even though our users repeatedly praised Zebra BI's speed, we've made it even faster. In some cases we measured it to be up to 10x faster than the previous version. Between 17th and 18th November 2014 Zebra BI will be presented at the DW2014 Data Warehousing conference in Zurich, the leading conference focusing on Business Intelligence, Data Warehousing and Data Management in Switzerland. Between 16th and 17th October 2014 the 14. Adriatics ICV Controlling conference is taking place in Portorož, Slovenia. This year's central topic is Action with Passion. Our CEO Andrej will be there as one of the speakers. His presentation is called 3 Critical Features of Truly Effective Management Reports. As many of you may know the HICHERT®IBCS conference is currently taking place in Frankfurt. We are present by sponsoring the event and presenting Zebra BI to wide audience of management reporting professionals. With the official launch we are also presenting many new features, such as one-click scaling of multiple charts, colorblind-safe color scales, enhanced charts, IBCS compliant commenting, straightforward creation of PowerPoint slides, etc.